The Peloponnese, Peloponnesos or even sometimes misspelled Peloponise or Peloponesse, is a large peninsula to the South of Manland Greece. Peloponnisos is sourrounded by other groups of islands, namely the Ionian islands to the West, The Saronic islands to the East and the islands of Kythira as well as the tiny island of Elafonisos to the South. The Peloponnese has a mountainous interior and deeply indented coasts, offerings amazing vistas and unspoilt beaches. It is made up of 6 regions. 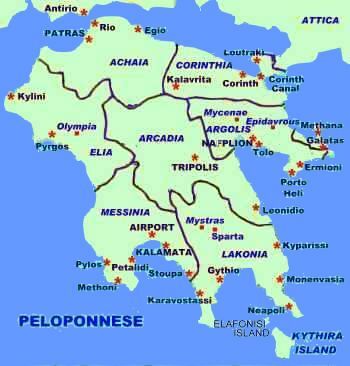 These are the Peloponnese regions of Corinthia or Corinth which includes the Corinth Canal and ski resort village of Kalavrita, the region of Achaia which includesthe main town and port of Patras, the region of Argolis or Argolida which includes Mycenae, Epidavros, and Nafplion, the region of Elia which includes Olympia, the region of Messinia which includes the town of Kalamata, the region of Laconia which includes Byzantine Mystras, Venetian Monemvasia and Sparta, and finally the central region of Arcadia which included the historical town of Tripolis. If we were to describe the Peloponnese nowdays,we would say that it is a place in Greece that has not really touched by tourism and a place worth hiring a car for and driving around dicovering all the tradition, history and beautiful sights, mountains, valleys, beaches and Greek villages it has to offer. Do bear in mind that the Peloponnese needs at least a 7 to 14 days of driving around, in order for someone to say that at least they have seen a large part of it. LOUTRAKI, a famous ancient spa resort, with magnificent view of the Corinthian Gulf and spectacular sunsets. Just 45 minutes drive southwest from Athens International Airport and with easy access to Epidaurus, Ancient Corinth as well as Isthmus, Nafplio, Delphi and Olympia only to mention a few places of interest in the vicinity. NAFPLION is one of the most elegant towns in mainland Greece. With it's marble pavements, towering castles, its medieval quarter and lots of historical monuments, Nafplion is not a town to be missed on your visit to Greece. The town is also a good base to visit the nearby archaeological sights of Epidavros amphitheater, Mycenae citadel and the tombs of King Agamemnon and more. Tolon, also known as Tolo, is a fishing village approximately 12 kilometers away from Nafplion. Tolon resort has repeatedly been awarded the Blue Flag by the European community for its clean sea waters. Due to it's key position, Tolon, offers an ideal base for exploring Argolis and the surrounding areas. Epidavrous amphitheater, Mycenae, Nafplion, Olympia, Monemvasia, Mystras are some of these areas. 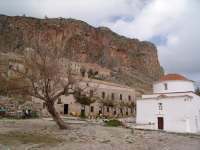 MONEMVASIA is build on a rock, and it is likened to the Gibraltar of Greece. The medieval castle city of Monemvasia is a magical place that during its long history has been conquered by many; Pirates, Francs, Byzantines, Saracens, Venetians, Turks and many more. Unique Monemvasia with its narrow alleys, impressive buildings, churches and museums, is a place that should be included in any visit to Greece and the the Peloponnese. 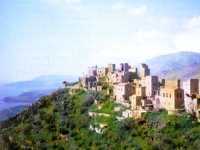 MANI area is a sparsely settled region where castles, traditional villages build around Mount Tayetos, and wild landscapes abound. GYTHEIO the Gateway to Mani is a lively port town with many fish tavernas and shops. The small island of Marathonisi, where according to mythology Paris and Helen consumated their ill-fated love, is connected to Gytheion by a causeway. From Gytheio and the nearby Neapolis you will find small boats that can ferry you on to the islands of Elafonisos, Kythira and Crete. Elafonisos island is a small island just south of Neapolis and north of Kythira island, popular with Greek holiday makers in the Summer, which has so far remained undiscovered and a well kept secret from the rest of foreign visitors that choose to holiday in Greece. Elafonisi is well known for it's superb sandy beaches, blue waters and great fish tavernas. Elafonisos island is an ideal location for sun worshippers, and it is ideal if you want to have a peaceful vacation in a traditional Greek island that has been left untouched by mass tourism. ANCIENT OLYMPIA, is another place in Greece that must be included in any itinerary. Olympia, dedicated to the father of the gods, Olympian Zeus, is considered to be one of the most important sanctuaries of antiquity. It is the birthplace of the Olympic Games and also the site where they were held every four years in archaic times. The river Alfios, and one of its branch rivers, Kladeos, that run near Olympia, have given the area a great natural beauty and have helped it prosper throughout the ages. KALAMATA the second largest city of the Peloponnese and the capital of the Messinian region. The old town of Kalamata was nearly totally destroyed by the Turks and rebuild by the the French engineers in the 1830's. The old town around the castle is picturesque and should be explored. Also worth visiting is the lively waterfront of Kalamata. Kalamata castle build in the 13th century is worth visiting for the wonderful views that are possible from the castle.